If you’ve been using iPhone for a long time and are planning on getting the new iPhone X, you should know that there are a lot of things you should learn before you get it as a lot of things on the iPhone X have changed and you can’t use it the same way you use your iPhone. The most obvious change on the iPhone X is its OLED display that covers almost the whole front of the phone with no places for the Home button. Without the Home button, a lot of things you can do with the Home button on old iPhones can’t be done on the iPhone X. Those are the obvious changes on it but there are also unnoticeable changes like the Power button. Now the Power button on the iPhone X is called the Side button and you can still wake your iPhone and put it to sleep with it. But the interesting part about this side button is that you can no longer power off your iPhone by pressing it for a few seconds. Now by long pressing the side button you will activate Siri. Now it’ll take a few more steps to power off iPhone X. To know how to shut down iPhone X, check out the content below. We’ll introduce to you several different ways to restart or power off iPhone X. On iPhone X, Apple offers you with different ways to power off your device. 1. How to turn iPhone X off with buttons. To power off iPhone X, press the Side button and one of the volume buttons at the same time for a few seconds until the Slide to Power Off slider appears on the top of the screen. Then you can slide to power off your iPhone X like you do on other iPhones. Note: Remember to press and hold both buttons longer because if you press the side button and the volume up button together and release them soon after you press them, it’ll just take a screenshot of your iPhone X. As you can see, you can do a lot of things with the Side button now on the iPhone X. It’s kind of convenient but also problems arise with it. With you frequently pressing the Side button, it could wear out very soon. And Apple’s been thinking ahead by adding an option in the Settings on iPhone X to let you power off iPhone X without the need of pressing the Side button. Here’s how to power off iPhone X in Settings. On your Home screen, open the Settings app, tap on General and scroll down to the bottom of this page and you should see the Shut Down option, tap on it to bring up the Slide to Power Off slider. It seems a bit more complicated then on old iPhone models to power off your iPhone. But in this way you won’t have to use the physical buttons on your iPhone. To turn your iPhone X back on, you can do it old school. Just press the Side button for a few seonds until the Apple logo appears on the screen of your iPhone X. Also when you use a lightning cable to charge your iPhone, it will also turn on automatically. 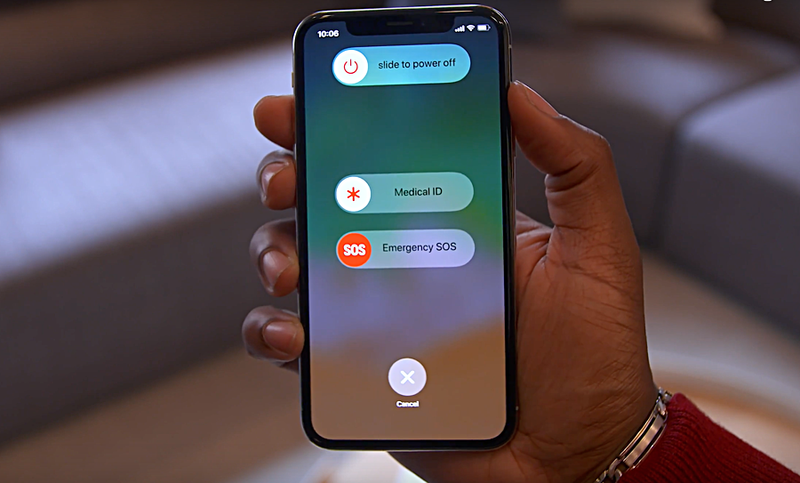 If you are powering off your iPhone X just to restart it, there’s a simple way for you to do that with AssistiveTouch on iPhone X. Apple added an option in the AssitiveTouch menu that would allow you to restart your iPhone X directly without using the physical buttons on your device. 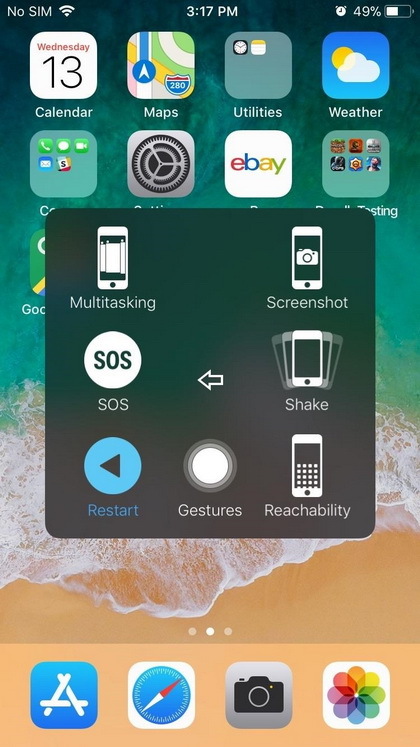 To use AssistiveTouch to restart your iPhone X, first go to Settings>General>Accessibility>AssistiveTouch and then activate AssistiveTouch. After activating AssistiveTouch, tap on it and then tap Device>More, and you should be able to find the Reboot option on it. Tap on it to restart your iPhone X.
There’s a way on the iPhone X that could allow you to quickly activate AssistiveTouch. Go to Settings>General>Accessibility>Accessibility Shortcut and select AssistiveTouch. And then you can activate AssistiveTouch by pressing the Side button for three times. If you just got yourself a new iPhone X, there are a lot more for you to learn, check out how to close apps on iPhone X and other iPhone X gestures you need to know. If you need a program to help transfer your music, video, contacts or other data to your iPhone X from your computer, your old iPhone or iTunes, check out Leawo iTransfer, it can help you transfer 12 different kinds of data between your iPhone, PC and iTunes and it’s very user-friendly, you’ll learn how to use it in no time.